" SOU・SOU KYOTO Zaifu monthly wagashi "
"Wagashi inspired by SOU・SOU's original textile design" in 2016,the theme of this year is "Japanese design". We are going to release pop textile designs in the motif of Japanese traditional patterns, and express seasonal wagashi in SOU・SOU's style. 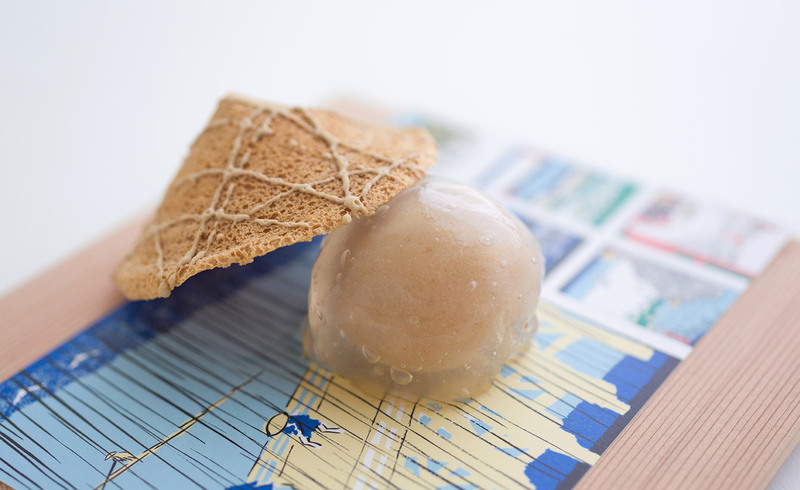 We hope you enjoy the pop wagashi made by "SOU・SOU × Kameya Yoshinaga". were widely loved since the Edo period. Most of ukiyo-e were woodblock prints and were affordable to ordinary people as they could be mass-produced. Thus, they developed into popular art. In a sense, ukiyo-e are similar to modern comics. This, in essence, is the soul of Japanese culture. 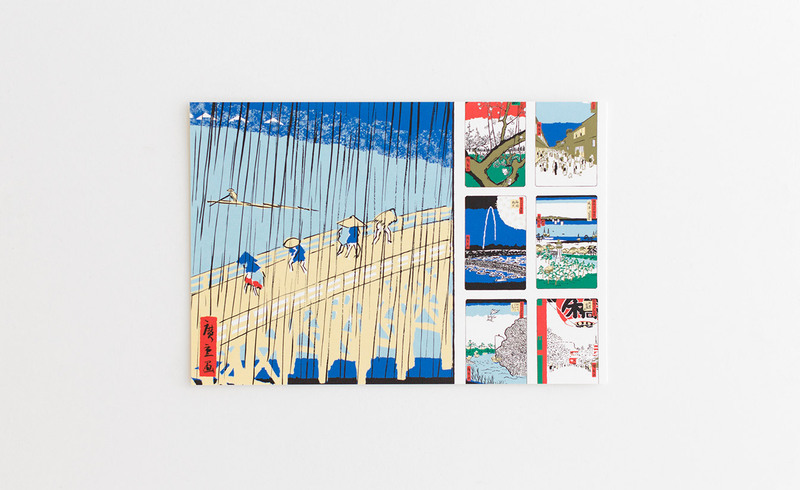 is the representative achievement of ukiyo-e.
June's textile design is about Ukiyo-e. 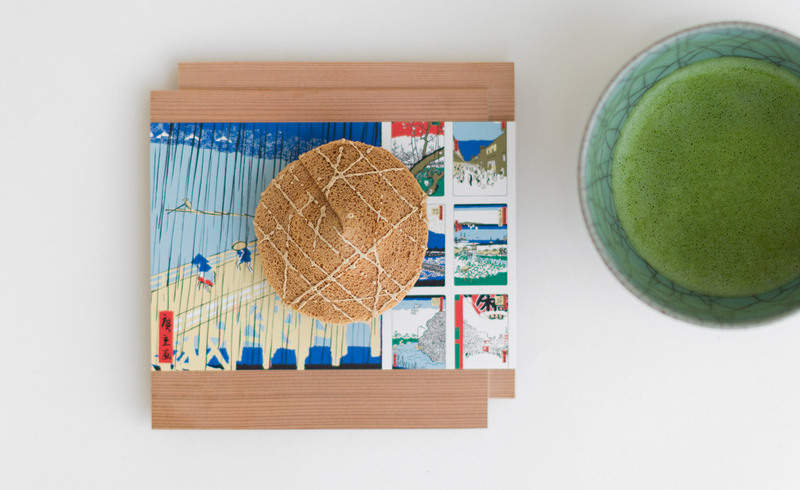 The textile wagashi for June is created in the motif of kasa, bamboo hat worn by the people crossing bridge, which is represented in Sudden Shower over Shin-Ōhashi bridge and Atake, from a series of ukiyo-e One Hundred Famous Views of Edo painted by Utagawa Hiroshige. 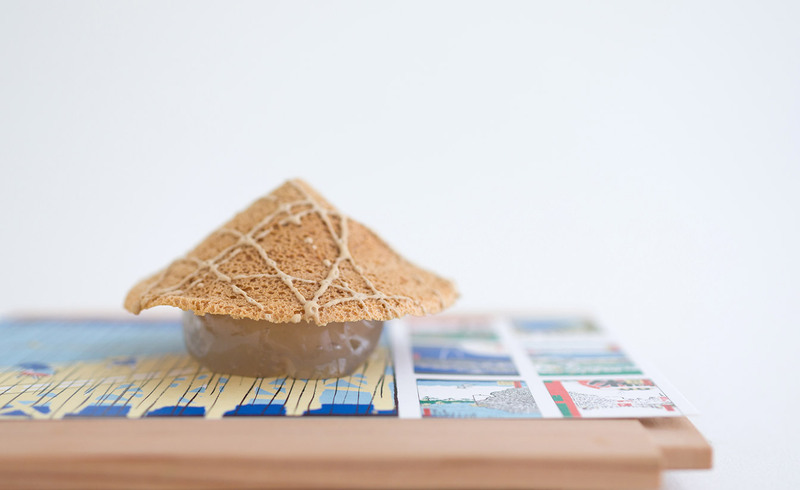 The bamboo hat is made of baked soybean senbei(rice cracker). To forming irregular strip pattern on the surface, we used suri-mitsu(cooled down mixture of cooked sugar and syrup) added with brown sugar. Under the bamboo hat covering an originally designed warabi-manjū. Its translucent appearance has a cooling effect during this dull rainy season. We stuffed the traditional bouncy warabi-mochi with an original paste, to add a rich aroma of soybean flour and velvety texture brown sugar jelly. The KAMEYA YOSHINAGA store descended from the famous confectionary Kameya Yoshian, that has the reputation of being one of the best Kyoto gourmet locales and it's fame reaches back to the Edo period when the store was first opened in 1803. Since then they've been in business in Sijo Samegai area in Kyoto till now. The owner of the store is the 8th generation.